A true picture of nearly any place in the West today, from Sydney, Australia, to Atlanta, Georgia. Works Cited - John Betjeman, Collected Poems, New York: FSG, 2006, pgs. 20-1. There are at the present time two great nations in the world, which started from different points, but seem to tend towards the same end. I allude to the Russians and the Americans. . . . Their starting-point is different, and their courses are not the same; yet each of them seems marked out by the will of Heaven to sway the destinies of half the globe. -- Alexis de Tocqueville, Democracy in America, Part I (originally published in 1835), edited and abridged by Richard D. Heffner, New York: Signet Classic, 1st edition, 2001, pgs. 141-2. Is post-Lincoln America the most important nation in the world, the one poised to do the most good for all the peoples of the earth? Those who believe the New England-Puritan dogma that the U.S. is a ‘city on a hill’ with a God-given mission (and right) to remake the world in its own image will say Yes. Those who have escaped that heresy and looked into history a bit more deeply and widely will come to a different answer: Russia. That statement will no doubt produce shock, anger, disbelief, and all manner of other exclamations of surprise in the minds and hearts and mouths of those raised on a steady diet of ‘American exceptionalism’. This is understandable in the light of the stigma still attached to the Russian people because of the barbarity of atheistic communism that dominated them for so much of the 20th century. That, however, was an aberration, a forced subjugation to outsiders who despised the centuries-old traditional Christian culture of the bulk of the Russian people, which we in the South know something about. But since we have seen the direction of the world under so-called American leadership - crushing debt, war following upon war, slavery to international corporations, government rules written to manage every aspect of life - it is nevertheless a notion that needs to have a proper hearing in all its dimensions, physical and spiritual. ‘In short, I think what we are looking at here is as much a geopolitical crisis as an economic one, and the stakes are quite high. By way of background, we would do well to remember one overarching geopolitical principle adhered to by the Western oligarchs since it was first enunciated by British geopolitician Sir Halford MacKinder: He who controls the Eurasian heartland (by which he meant Eastern Europe and a considerable portion of Eurasian Russia) controls the World Island (by which he meant the great world island comprised of Europe, Asia, and Africa). He who controls the world island, with the bulk of the world’s resources, controls the world. It is important to recall that as recently as Zbbnw Brzznsk’s (that’s Zbigniew Brzezinski to those unfamiliar with my vowelless disdain for the man) The Grand Chessboard this geopolitical dogma of the Western oligarchs has simply been “revised and extended” but not abandoned. ‘We know for a fact that the 1917 Revolution in Russia was organised and implemented by the Western Powers in order to destroy Russia, its rival, one which, in their own words, would have become more powerful than any Western country by 1950. Therefore, British and the Americans sent Trotsky and the Germans sent Lenin to carry out the Revolution in Russia. We also now know that the order to assassinate the Tsar and his family actually came directly from New York – just as the Tsar himself had predicted it would, some ten years before. The Soviet Union was a purely Western foundation, founded on the Western ideology of Marxism. ‘However, in creating the Soviet Union, the West made a strategic mistake, a rod for its own back, because of course the Soviet Union became very powerful, the second ‘Superpower’. This was not as the West had intended, for the Nazis were supposed to destroy the Soviet Union. The West had not counted on historic patriotism and sense of national identity, a movement far deeper than the superficial Soviet Union. Therefore, when the Soviet Union fell, over twenty years ago now, the West’s greatest fear was that a free and independent Russia would be born, that, having thrown off its shell, the tortoise underneath it would turn out to be a hare. Hence the ‘Wild East’ chaos which the West encouraged in the former Soviet Union in the 1990s with its ‘divide and rule’ policies and privatisation. This was nothing more than institutionalised theft from the people. ‘The problem for the West came in the year 2000 when Russia finally recognised that it had to recover from this ‘Wild East’ Capitalism, the Mafia State, and set out on the very, very long path of recovery under President Putin. Therefore, the West had to destroy Putin. In some respects, he is an easy target because he rules over a post-Soviet country, still full of that corruption and mafia mentality introduced there in the 1990s. Therefore, it is easy to attack Putin’s Russia (although it is doubtful if the amount of corruption there is any greater in reality than in the EU or the USA) and Putin has been lamentably slow and weak in tackling corruption. Following Fr Andrew’s cue, then, let us transition from the material to the ghostly. ‘At various times this great people [the Russians] will fall into sin and for this will be chastised through considerable trials. In about a thousand years [i.e. in the 1900s] this people, chosen by God, will falter in its Faith and its standing for the Truth of Christ. It will become proud of its earthly might and glory, will cease to seek the Kingdom and will want paradise not in Heaven but on this sinful earth. ‘However not all this people will tread this broad and pernicious path, though a substantial majority will, especially its governing class. On account of this great fall, a terrible fiery trial will be sent from on high to this people which will despise the ways of God. Rivers of blood shall flow across their land, brother shall slay brother, more than once famine shall visit the land and gather its dread harvest, nearly all the churches and other holy places shall be destroyed or suffer sacrilege, many shall perish. ‘A part of this people, rejecting iniquity and untruth, will pass over the borders of their homeland and will be dispersed like unto the people of the Jews all over the world. Nevertheless the Lord will not show His wrath on them to the uttermost. The blood of thousands of martyrs will cry to the heavens for mercy. A spirit of sobriety will grow among this chosen people and they will return to God. At last this period of cleansing trial, appointed by the Righteous Judge, will come to an end, and once more Holy Orthodoxy will shine forth and those northern lands will be resplendent with the brightness of a faith reborn. ‘And then? Then, when the fullness of time has come, a great decline in faith will begin and everything foretold in the Holy Scriptures will occur. Antichrist will appear and the world will end’ (Archbishop Seraphim of Chicago, ‘Sud'by Rossii’, Pravoslavnij Vestnik, (The Orthodox Herald), № 87, January-February, 1996 (Canada, in Russian); Fomin, Rossia pered Vtorym Prishestviem (Russia before the Second Coming), Sergiev Posad, 1994, pgs. 316-318; translated in Fr Andrew Phillips, Orthodox Christianity and the English Tradition, English Orthodox Trust, 1995, pgs. 299-300. Quoted in Vladimir Moss, The Restoration of Romanity: Essays in Orthodox Political Theology, 2012, Pgs. 221-2. Accessed 24 May 2013. PDF copy available at http://www.orthodoxchristianbooks.com/downloads/373_THE_RESTORATION_OF_ROMANITY_3_.pdf). III. What about the Tsar? ‘The Orthodox Churches live and have lived in all countries and under all sorts of regimes: Pagan, Communist, post-Soviet, Fascist, Capitalist, Catholic, Protestant, Muslim etc. 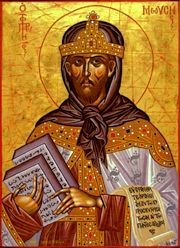 However, history shows that the Church is able to influence society for the best when there is an Orthodox monarch. ‘Here we must emphasise that the Orthodox use of the word ‘monarch’ means something quite different from the Western usage. In the West it means a right-wing figure, who is extremely powerful and rich and uses that power and wealth to exploit for egotistical purposes, a kind of permanent Tony Blair or any other self-deluded narcissistic megalomaniac. Conversely, in Orthodox language, a monarch means a popular monarch, whose power and wealth exist only for the people’s benefit. His sovereignty is the reflection of the people’s sovereignty. Christian monarchy is where the people are the guarantor of the monarchy and vice versa. That is quite different from the absolutist and despotic monarchies with which Western history is littered. In 1917 Russia fell because of thoroughly corrupt and self-serving aristocrats, oligarchs as we would call them today, who connived with foreign powers, overthrew the monarchy and betrayed the monarch-loving peasants and workers, whom they ruthlessly exploited. To help the reader grasp just what Russia really is, a poem by the Russian poet Sergei Bekhteyev, ‘The Tsar’s Russia’, translated by Fr Andrew, is presented below. For poems often express truths better than prose. Brave sacrifice in the noble battle bold. Lips that whisper of deep-held love without fault. The age-old surplus generous enough for ease. Bravery and courage in the dance taught her. To the great home of honest service and toil. The tears that are wiped away by the kind hand. She Who believes in God, She Who seeks the right. Seeing all this - the decline of Washington City and much of the West into ever deeper corruption of body and soul, and the slow rise of Russia from a terrible pit of darkness back to her Christian moorings - the South has a decision to make: Continue in league with and under the control of Washington City, or separate from that vile place and begin cultivating ties with the better parts of Russia, such as the Church, the villages, and the royal family, and of the other nations of the Slavic world (Serbia, Romania, et al.). Is it not better to suffer with the righteous in their struggles than to live a life of ease in the comfortable cities of the wicked? This Memorial Day . . . Celebrate a foundational American principle: secession! If it was a good idea for the British colonies in 1776, for these same States again from 1787-90, the nations of South America in the 19th century, East Timor, South Sudan, the republics of the former Soviet Union, and Ireland over the last 100 years, and for Scotland and Catalonia in the near future, then it is surely still a good idea for Alaska, Vermont, Texas, Tennessee, etc. today if they find that the federal government has become a harmful burðen to them, rather than a boon. Hopefully, though, we are getting ever closer to its fulfilment. 'A leading Russian political analyst has said the economic turmoil in the United States has confirmed his long-held view that the country is heading for collapse, and will divide into separate parts. The complete story from RIA Novosti is here. 'The multiplication of the paths of exchange will soon lead to its logical conclusion, and we will only see on the market those goods produced by the most miserable of peoples. The Chinese will become the world's best workers because they only require that their animal needs be met. Later, the worker, the engineer, the salesman, and the banker himself will be purchased on the open market. Then the banker of London, Paris, or Vienna, having made himself rich by putting his capital to work in China, will in turn face an unequal struggle against the Chinese usurer, who will not give himself the luxuries of a princely palace, teams of horses, parties, and the life of the rich. An irremediable decline awaits the economic order of the civilization of the West at the end of this path of freedom of labor, a path down which it is led by the teaching of the philosophers, the science of the economists, and the power of the capitalists.' -- René de La Tour du Pin, 'On the Corporate Régime' (1883), Critics of the Enlightenment: Readings in the French Counter-Revolutionary Tradition, C. O. Blum, ed., Wilmington, Del. : ISI Books, 2004, p. 326. It is long past time to rethink the rules governing our political economy, from farming to heavy manufacturing, if wish to be more than paper pushers for giant international corporations or welfare recipients of giant governments. That is the direction we are moving unless we take the difficult steps needed to reintroduce morality into economics, so that small family farms and businesses can be secure in their property and livelihood from generation to generation. Control, Part II: Is This What Gay 'Marriage' Is Really All About? Destroying the family so the central government will be able to touch every body and soul directly, without having to bother even with a mother and a father? 'Why is it that nearly every elite institution – news station, newspaper, sit-com, talk-show, school, university, and so on – has made gay-marriage the object of its most fervent devotions, not children growing up without fathers? 'What of other issues that might be on the agenda? Too big to fail? Imperial overreach? Drone strikes? Massive and growing inequality between the well-off and the working class? Yes, those are problems. But is every elite institution devoting anything comparable to similar energies to any of these issues as they are to the drumbeat of “marriage equality”? More proof that the spirit of the New England-Puritan busy-body is alive and well in totalitarian Washington, D.C.: the federal National Transportation Safety Board is pressuring the States to lower the legal blood alcohol level to ridiculous levels. The thirst of the elite to direct even our smallest affairs cannot seemingly be slaked. A couple of lights glimmered forth this week in the realm of political economy. The full story from The Telegraph. 'It is not enough to say that persons mutually constitute each other through concrete relationality. Genuine human relations need to be “eventlike” because Jesus Christ is the Event, “on which all other events are based, an event which took place in history, and an event which is produced in the life of people, an event which sums up and guarantees all other events, personal or historical, and renders history and life absolutely irreversible”. Only in Jesus Christ and His Church, the self can grow into a person, a body-event. We are not only witnesses to the Christ-event; in the Eucharist, we appropriate Him in our body, we are in the Event. For our whole life we are struggling to grow in our experience of the Holy Spirit so that we might shine forth like body-events. 'Any event is localized (rooted in a certain time and place), it originates in a point and unfolds into an event-like situation. An event is neither an accident nor an incident, it is transformative, an augmented reality – it is tension towards perfection. Only localness, all that is in situ, what is concretely localized can grow into an event. Localness should not be the rural desert of today, the sleepy, “interchangeable” little towns where nothing happens. If today the local is a desert, this is partly because Christianity has neglected its Trinitarian tradition; accordingly, everything personalized became gradually homogenized and, since the event of the Incarnation until the event of the Second Coming of Christ, nothing really happened—all history is homogeneous. 'How to live our daily life like an event? How to bring back an event-like existence to the local community? The complete essay is found at The Distributist Review web site. It is not a long book. It does not contain intricate theories of government. But it is remarkable, and this is because it shows what a great nation truly is: the lived faith of the people, their close ties to the land and weather, the language, the sufferings experienced in common. Southerners will see many things they have in common with the Lemko people, and, if we are wise, we might also perceive through their experiences how we can endure our present oppression and how we can reach our goal of freedom. Mash here to learn more about The Blue Lady of Sycamore Hill. First, as his own writings in this book show, the North and the South are two very different peoples - grim, fundamentalist Puritans and easy-going, Christian squires and yeomen. There is not simply 'one American nation', except in the sense that all the peoples of all the States are now forcibly ruled by Washington, D.C. Which leads to the second rebuttal, that the South was not converted to a loyalty to the American Empire by a happy and free choice. She submitted to this foreign rule back then out of sheer necessity, under the brutal circumstances of much bleeding and starvation and things worse than these; today, because of imperial propaganda (inside the schools and out) and ignorance of her own good inheritance. But even with these views, Mr Chesterton would have been a more than welcome addition to the Southern family if he had wished to remain here. What family, after all, does not have disagreements from time to time? And who is to say that he might not have changed his mind on some of these matters under the influence of works by a Col Taylor or a Rev Dabney (or by simply experiencing the life of Southern folk for an extended season)? The NATO attack on Libya tore away most of the covering, but the present proxy war of NATO/Israel/the U.S. against Syria has fully revealed the lie that is The War on Terror. The coordination of Western countries and Al-Qaeda Syrian rebels against Assad's government shows what a sham this War really is. 'Israel’s airstrike on Syria was timed to precede an Al-Qaeda-led rebel offensive against President Bashar Al-Assad’s forces according to Egyptian and Jordanian intelligence sources, underscoring once again how jihadists are doing the dirty work of the very powers they claim to oppose. 'As we highlighted yesterday, Israel and the United States routinely rely on Al-Qaeda to destabilize their enemies in the region. 'Not only has Israel supported Al-Qaeda-led rebels in Syria, even setting up field hospitals for injured fighters, but back in 2002 Israel was caught actually creating an Al-Qaeda group in order to justify attacks on Palestinians in the Gaza Strip. 'The United States and Israel have also armed and funded Al-Qaeda-affiliated groups in Iran to carry out bombings and assassinations for years. 'NATO powers also openly armed and funded the Al-Qaeda-affiliated Libyan Islamic FIghting Group to topple Colonel Gaddafi in 2011. 'Near the city of Aleppo, armed terrorists have kidnapped the Antiochian Orthodox Metropolitan Boulos (Paul) al-Yazigi of Aleppo and Iskanderun and a Syriac Metropolitan Ibrahim. . . . Rejecting The War on Terror does not mean that Muslims must therefore be embraced as model citizens of the world. So long as they hold to the violent teachings of Muhammad in the hadiths, etc. they should be viewed with a wary eye. Afterword: Keep all of this mind also whenever you are asked (or told) to give up this freedom or that to prevent Al-Qaeda attacks here at home. The Holy Prophet Moses, Deliverer of Israel . . . and the South? Holy Prophet Moses, pray for us sinners! Dr Farrell marks out some signs that the American Empire is in an advanced state of decline in his latest news video. This could spell good and bad for the South: good, because the demise of imperial Washington, D.C., would mean freedom for the Southern States and the other States of this unfortunate union to chart their own course; bad, because the federal dictators may lash out in their last death spasm to try to keep everything from slipping out of their grasp (confiscating property like the government in Cyprus, declaring wars abroad or martial law at home, etc.). Let us do our best to be well prepared for any event.